I have always been fascinated by the river life of the Mekong Delta in Vietnam. Growing up in Saigon in the sixties I loved our family trips to the Delta & Saigon River. The sound of the boats & the river scenes still echo in my memory. 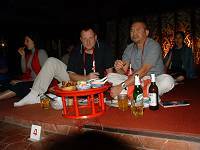 Our trip in December 2005 is to look at some options for a new Mekong River tour for 2006. We arrived in Chiang Mai on 25th December, Christmas Day. The Northern Thailand climate is bit cooler than the heat of Bangkok. For us from the UK it is like a nice spring day but it is winter for the local people in Thailand. We checked in at the 3* Imperial Mae Ping. This is a very good 3* hotel with swimming pool located in the centre of the town near the night market. The room is large & comfortable. We will use this as our choice in our 'standard' hotel category. Our tour of Chiang Mai begins with Wat Suan Dok. 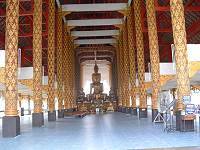 This is not a grand temple but it contains a 500 year old bronze Buddha. There is an interesting group of white washed Stupas nearby, the burial ground for the royal family of the Lanna Kings. We also visited the oldest temple in the area, Wat Chiang Man, over 700 years old and inside the old city wall. Afterwards we drove 20 minutes out of city to see the famous Doi Suthep on the hillside. 300 steps lead up to the pagoda complex but fortunately our driver was able to drive us up to the top & we walked down the steps afterward. This reminds us very much of the famous Shwedagon Pagoda in Yangon, Myanmar. One can see the city of Chiang Mai from here, if weather permits. The dinner at the Chiang Mai Culture Centre with traditional Northern Thai food & Thai dance was most enjoyable. This centre is a large open restaurant with hundreds of diners sitting around the four sides at different levels. Our Thai agent has reserved the best seat for us right at the top of the restaurant behind the musicians, giving us a good view of the restaurant, diners & performers. The food here is in the Northern Thai style with several different dishes served in a large tray. The deep fried chicken dipped in spicy sauce & the beef curry were particularly good. After the meal & the performance there is a separate dance show in a smaller theatre nearby that is well worth a visit, featuring hill tribe music & dance. Next day, Boxing Day, we visited the elephant camp. This is a lovely experience as the 10 or more elephants of different sizes train and perform for us. 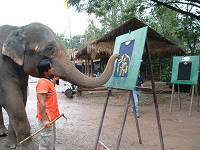 Near the end of the show the elephants demonstrate their painting skills - just wonderful to witness! 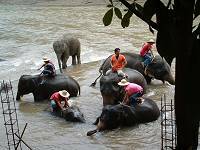 Normally visitors take an elephant ride, crossing the river & through the jungle, ending with a ride by oxcart to a restaurant for lunch. 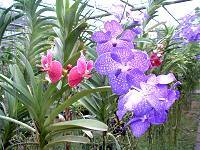 No such luck for us, though, as we have to return to Chiang Mai for hotel inspection, but there is time for a quick visit to the Orchid Farm. 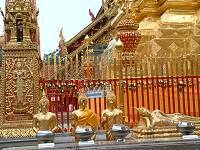 There are many hotels in Chiang Mai but we selected several to offer to our guests. In the 'standard' category we offer the Imperial Mae Ping & Central Duangtawan. The Central is a large 3* hotel located right at the doorstep of the famous night market. It has the huge entrance & foyer like an imposing 5* hotel. They have recently built a Chinese restaurant at the top floor of the hotel with wonderful Chinese food on offer. The sales manager, Ms. Chaemvimol, invited us for a meal of delicious Dim Sum & Chinese dishes which was as good as any we have tasted in Hong Kong. For 'superior' hotels we chose the Amari Rincome and Tamarind Village. We use many Amari hotels in different parts of Thailand & it is not surprising that the Amari Rincome also offers a good standard of rooms & facilities. The Tamarind Village is a delightful boutique hotel with 40 rooms only, built in an ancient village style surrounded by walls and cloisters with inner courtyards & gardens. This creates a beautiful and serene environment. The rooms are stylishly designed in traditional style. For our 'Deluxe' hotels we offer the fabulous Four Seasons. Our clients who have stayed here made very flattering comments about this hotel. Situated in the Mae Rim Valley with a backdrop of mountains, the resort is surrounded by rice fields & lily ponds. The two level swimming pool overlooks the rice fields below. Each room is a Lanna-style pavilion built as a haven of luxury. The veranda/terrace adds a comfortable outdoor seating area to enjoy the beautiful gardens. For a really relaxing 'wind down' just visit the resort's beautifully designed spa centre. Do not forget to wander around the night market at the centre of Chiang Mai after your evening meal. This nightly market is where you can do all your shopping for local products in one place. Next morning we are heading by road to Chiang Rai.